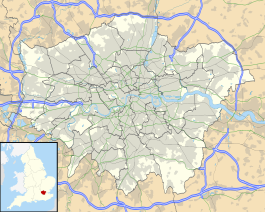 Bruce Grove is a London Overground station on the Lea Valley lines located in central Tottenham in the London Borough of Haringey, north London. It is 6 miles 28 chains (10.2 km) down the line from London Liverpool Street and is situated between Seven Sisters and White Hart Lane. Its three-letter station code is BCV and it is in Travelcard zone 3. Bruce Grove was originally a stop on the Stoke Newington & Edmonton Railway and opened on 22 July 1872. Today it is on the Seven Sisters branch of the Lea Valley Lines and sees four trains per hour to Liverpool Street and two to either Cheshunt or Enfield Town. The station is not far from Bruce Castle and takes its name from a road forming part of the A10. In the early 1980s several changes were made to the appearance of the station. The wooden covered staircases to both platforms were replaced by open-air concrete staircases. The London-bound platform roof was shortened and the waiting rooms boarded up. The northbound roof opposite (which was identical) was completely removed and a small shelter built of brick was installed in its place. This shelter lasted for nearly 20 years before it was demolished and a new roof, built in the style of the original, although much shorter, was constructed giving the illusion of original authenticity to the station. Haringey council funded the work and the station is considered a site of historic interest in the locality. Despite being in the heart of Tottenham and being at one time a busy station, Bruce Grove's ticket office is rarely open. In May 2015 the station and all services that call there transferred from Abellio Greater Anglia to become part of the London Overground network. In November 2015 a major facelift for the station was announced. Trains are operated by London Overground. 2 tph to Enfield Town. London Buses routes 123, 149, 243, 259, 279, 318, 341, 349, 476 and W4 and night routes N76 and N279 serve the station. 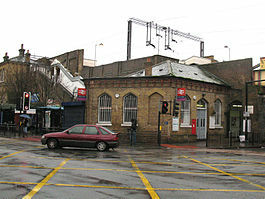 Wikimedia Commons has media related to Bruce Grove railway station. This page was last edited on 18 December 2018, at 19:13 (UTC).